Only one step and I found myself in an amazing place. Just behind me, only two meters away was Lubyanka Street, a flood of honking cars and people rushing to work. But in front of me beyond the monastery gates were roses in bloom, a pond with a babbling stream, and icons with burning oil lamps between groves of trees. Rays of the morning autumn sun illumined the church’s domes. But most amazing of all was that I had passed this place hundreds of times and never even noticed the splendor just beyond the trees. I could not believe my eyes. 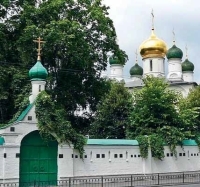 Could this really be the center of Moscow? But the further I walked along the well-kept and manicured paths, the more people—monks and laymen—I met coming out of the church, the more markedly did I comprehend that this was all for real. And do you know what was lingering in the air? Peace, quiet, and something inimitably cozy, like something from childhood… You don’t believe it? Don’t be lazy—go take a look for yourself. I had already read Everyday Saints a long time ago. To be honest, I wasn’t surprised at the readers’ enthusiastic remarks and the book’s many literary awards. To the contrary, I was amazed at the reaction coming from people who, to say the least, are not avid readers. Did it cause a revolution in their consciousness? Did it get them to start reading again? Not at all. The “non-reading readers” really did “dig” into their memory, recalled, thought over, and reassessed their meetings with people who had turned their lives around. 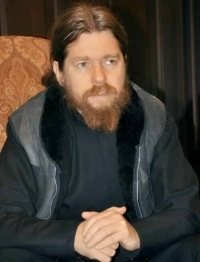 —Father Tikhon, tell us about the events leading up to the creation of your book. How did you get the idea to write it, and why now? —I had told these stories many times before to my students, friends, and brothers of the monastery. Some of those who heard them asked me to write them down, and since I have written many things before and am used to writing, at a certain moment the structure of the book took shape, and it looked interesting to me. You know, I think that every writer is really writing to specific people. The second no less important—although somewhat egotistical—element is that what you write must be interesting to you. Well, I felt that both of these elements were present. The work took two years. I needed to edit it eleven times before I felt it was ready to be given to other editors. The result was this book. To tell the truth, when I wrote it I consciously set an important goal for myself—to take the reader into ANOTHER world populated with its own heroes, having its own space and time. I thought to myself that if I can achieve that, I’ve achieved everything. —Regardless of this mission impossible, you have said many times that you were surprised at the book’s “unexpected success”. How can you explain the phenomenon of this book among the broader reading audience? The book has a life of its own: we have received tens of thousands of responses by mail and on the internet. On October 5, 2012 the English version was presented in the Library of Congress in Washington DC, the French translation is due for release this autumn, in Greece they are printing a second edition, and a Spanish translation is being prepared. In Russia, the book has come out in large print runs—1,100,000 copies, and as the experts have told me, around 4,000,000 electronic versions have been downloaded. —We haven’t done anything to prevent free access to the electronic version. —I could never bring myself to download a pirated copy of that book. Many internet readers have told me that after downloading the book from pirate sites and reading the first few chapters, they went to the store and bought the printed version to read the rest. You have to admit, this is a unique situation for a contemporary book. —Yes, the book has a life of its own, and I even keep myself somewhat distanced from its future fate. Some truly amazing things are happening. Not long ago, Fr. Matthew Samokhin told me that a woman came and told him that she had fallen into such a hopeless situation that she had decided to commit suicide. She had prepared the pills, but was biding her time. Her gaze fell upon the book Everyday Saints that someone had recently given her. In that state of utter despair she sat down and started reading it, read it all night, and in the morning went to the church to give confession. What greater reward could a priest, a writer, or any man receive? In a case like this you understand that you are nothing and no one—you were only granted to be the instrument of God’s providence; you did something that you yourself don’t entirely understand… Then suddenly it begins to work with infinitely more power than you could ever have supposed it would. —A perfectly natural question from your readers: Will there be a sequel? —I am thinking about that now. Recently I have had to travel much around the country, meeting most often with students. They often begin to tell me their own life stories. This is how the thought came to me to compile Everyday Saints 2, and to offer people to send their stories to our website, Pravoslavie.ru, for example. We will put the best ones on the site for people to discuss, and then make a book out the ones that readers chose as the best. As for me personally, it is of course a nice idea to do a sequel, but unfortunately I just don’t have enough time. After all, I am a priest and the abbot of a monastery, the rector of a seminary, and moreover an ecclesiastical bureaucrat with a number of routine obligations. That is why the book was practically never written at a desk; all the writing mainly took place “on my knees”: in the car, in the airplane, on business trips, in hotels, and in all different countries from Japan to Greece. Generally speaking, if you mention plans, I had a dream of making not a book but a film, and had even made an agreement with one of our central television channels to create an eight-part feature series, the main heroes of which would be two men. The first is a Russian saint, Archbishop Luke (Voino-Yasenetsky)—a professor, a talented doctor, who became a priest and then a bishop in 1927, during the worst persecutions against the Church. As could be expected he was sent to the labor camps, from which he was released during wartime to work as a surgeon. Already a bishop, he became the head of all the evacuation hospitals in Siberia, led the life of an ascetic, and received a 1st degree Stalin award for his book on purulent surgery, which was used by several subsequent generations of Soviet doctors. The second protagonist was Stalin. These were two entirely separate worlds in Russia of that period. So, first I took a month leave, went to Greece near Mt. Athos, and wrote down all the main points of the scenario, then came to Thessaloniki, left my bag with my computer in the car, walked into a store, and returned to find the window smashed and the bag stolen. Therefore, in order to realize this dream I will need to find at least a month of relatively free time. —You do a lot of travelling, and talking with young people. What kind of questions do students ask you? —It becomes ever clearer from our conversations what problems are now most troubling our young people, and this means they trouble all of society. The main problem, other than questions of faith, is inter-ethnic relations. The second most important problem is the drunkenness, alcoholism, and drug addiction we see everywhere. Do you remember how we once saved our northern peoples from killing themselves with alcohol? Now the same question has to be raised about the Russian people. If the Russians, around whom our country has formed, are not shown some real support, then the Russian provinces will continue to drink and fall into degradation. I say without exaggeration that a huge amount of complex work is now being done, but few know about it. New, reasonable laws are being passed to place limitations, and young people are being offered more healthy alternatives. There is yet another question that they all raise without fail: the lack in our country of healthy and intelligible humanitarian politics. We are often told that there is no ideology in the West. Forgive me, but what about Hollywood, for example? Isn’t it a machine that brings all of America, even the whole world, in line with its ideological patterns? —The eternal question, the conflict between parents and children, has taken on new features in the present age. Internetization, or computerization, is today both a benefit and a danger at the same time. Mothers who read our site and are worried about their children’s addiction to social networks, computer games and gadgets have addressed a question to you. What should they do in order not only to make their teenagers feel adequate in the virtual world, but to also become truly worthy human beings in the real world? How can they find a balance? —The upbringing of children is a great and daily creative process. It is the parents’ hard work and constant, wise attention to their children. I have many times had to confess people on their deathbeds. Their confessions are not about not having earned a million dollars, built a luxurious home, or been successful in business. People in their final hours are first of all full of regret for not having done some good, not having helped or supported their family, friends, or even incidental acquaintances. The second thing that torments almost everyone before death is that they gave so little time to their children. That parents here do not know the lives of their children is something I have become absolutely convinced of. We made some films on the theme of anti-alcoholism and spoke with some teenage girls who study in excellent schools. These girls drink alcohol every day—well-advertised energy cocktails, then beer, and on down the list… Every day! According to the Russian Department of Consumption, 30 percent of all boys and 20 percent of all girls above the age of thirteen consume alcoholic beverages daily. But their parents do not know about it. And there is quite a bit more about which their parents have no inkling. For example, the fact that many teenagers age thirteen to fourteen live an adult life, and by age seventeen have already gone through a large number of “partners”. Such things are by no means rare, unfortunately. But I cannot comprehend their real massiveness. What percentage of the young generation will be able to create a normal family if a huge percentage of marriages fall apart after roughly two years? Therefore, if we talk about the relationship between parents and children, it would seem that we first have to talk about constant, daily, but at the same time wise, unobtrusive attention to them. This is an enormous job. —Let’s return to the book. You are using the proceeds to build a church, correct? —We have a church in our monastery which is the only one remaining of the original four. But it cannot contain all the worshippers, and many have to stand outside, even in winter. Sretensky Monastery is located on Lubyanka Street, and we know what happened here in the last century. We want to build a church that will be called the “Church of the New Martyrs and Confessor of Russia on the Blood, on Lubyanka.” We plan to consecrate it in February of 2017. All the proceeds received from sales of the book in and outside of Russia will go to the building of this church. —You head the publishing house in your monastery. What kinds of books do you publish? —Our publishing house is first of all a religious one. We publish books about the ancient ascetics of piety, the holy fathers, books on history, apologetics, a good amount of classical literature, and textbooks for our institutes of higher education. Incidentally, these textbooks are also used in secular schools. We also publish art albums. Every year we publish 250–300 books. This is basically our main service, and at the same time, our main financial support. Furthermore we have a seminary where 200 students study for six years, and we support them as well. We have a children’s home with 100 children who come from difficult, dysfunctional families. There we only provide financial support, while professional teachers (including priests with degrees in education) and caregivers actually work with the children. The internet site Pravoslavie.ru also requires money to produce. Thus, the publishing house bears a humanitarian, educational, and financial burden. —As far as I am aware, it is one of the most successful religious publishers in Russia. Where else can your books be purchased? —Our books have been sold for a long time in “Biblio-Globus” [one of the largest and most popular bookstores in Moscow —Ed.]. We are very grateful to that company’s administration for giving our books such a great degree of attention. This is very important for any publisher. —What do you prefer to read? —You know, I used to be a devourer of books. I would read my favorite Dostoevsky novels twice over each year. I loved the great novels of Leo Tolstoy. Also the Western classics. And of course, Pushkin… But something happened to me thirty years ago and I nearly stopped reading those works, because I discovered a whole continent of another kind of literature—St. John Climacus, St. Isaac the Syrian, St. John Chrysostom, St. Ignatius Brianchaninov, St. Theophan the Recluse. Their works are so grandiose that after becoming acquainted with them it is not so easy to go back to reading bestsellers. From time to time I read memoirs; I don’t like fictitious stories. To be quite honest, I feel a little deprived for not reading modern literature, but what can I say. It all comes back to time. You have to read when you are young and have the time—and your whole life ahead of you. —Thank you for this interesting conversation!